For the last three years I have stayed connected to the world around me and our far reaching networks with help from my Blackberry. The service provided by this device has slowly but dramatically declined over the last year. My phone is my office, my assistant, my lifeline most of the time. Without a smartphone I have no idea how I would do my job effectively. So a very tough decision was made, abandon the Blackberry and find a new smartphone to be my right hand. After months of reading reviews, talking to sales clerks and trying out devices I have a new phone; an iPhone 4s and it sure it pretty. I already have an iPad and Josh has an iPhone so we were already on the Apple bandwagon. It was not a hard transition and I do like the new phone. There are things that I don’t like and miss about Blackberry but with an 8 mp camera I’m not looking back. I have jumped ship and there is no going back. This entry was posted in Christmas 2011 and tagged iPhone. Bookmark the permalink. 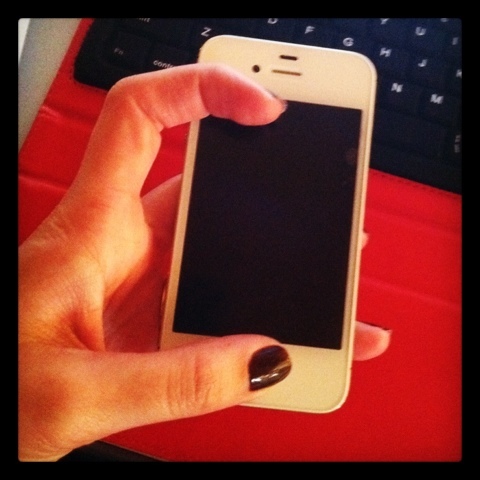 oh do I know the feeling….loving my 4s more all the time…check out the snapseeed app…you’ll love it, I think! We’re still using an old pre-paid mobile phone occasionally. Usually it has a flat battery or no credit.